THE WHAT: Want to treat your mom to a relaxing pre-mother's day morning? Do you and your mom squad want to reward yourselves with a morning out? Or maybe you just want to do some yoga and have a mimosa with some fun people. No matter the reason, we would love to have you stretch & sip with us! It’s our 2nd annual Mother's Day weekend event featuring a one-hour yoga session led by Jordan Aftanas followed by mimosas. Please bring a yoga mat if you have one; we will have a few extra but not enough for everyone. We honor every type of mama-bear out there—new moms, empty-nesters, single moms, adoptive moms, expecting moms, cat-moms, dog-moms, dads who are moms too. Once you're a mama, you're always a mama, and we celebrate you. THE WHY: We move in support of Levé's 2019 nonprofit partner, Cascade Aids Project (CAP), a nonprofit offering full-spectrum services to test for HIV and assist those living with it. Their mission is to support and empower all people with or affected by HIV, to reduce stigma, and to provide the LGBTQ+ community with compassionate healthcare. Get ready to MOVE FOR GOOD! 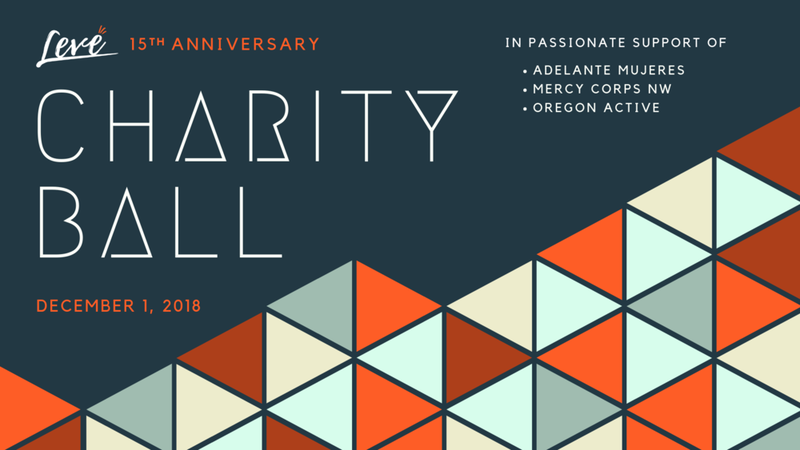 Charity Ball is our annual signature event—a high-energy, year-end celebration for a cause. Each one has a unique feel inspired by our nonprofit for the year featuring a dance party, silent auction, raffle, drinks + bites, and lots of celebratory fun. Tickets will NOT be available at the door, so be sure to buy them ahead of time!